As the cooler weather sets in I find myself more and more drawn to the neutrals in my closet. One of the neutrals I'm currently obsessed with is navy, I just can't seem to get enough (or have enough in my closet!). I think it pairs so well with the other neutrals of fall, camel and burgundy. At least what I consider to be the neutrals of fall, because you can pair them all with such a wide variety of colors, but especially each other. Here are a few of my current navy favorite finds. I wouldn't hesitate to add every single item into my closet, in fact I kinda wish I could right now! I've had my eye on that Lily Pulitzer Planner for while now, and that Old Navy Jacket looks perfect for the fall, plus they are running 20% off right now online which doesn't hurt either! My nails have been navy for the last week, which may have inspired my obsession! Pair together a little navy and gold and to me you have the ultimate, classic, sophisticated look. What color are you obsessing over this fall? I love your inspiration board! I've been all about navy, too - I agree that navy paired with camel or burgundy or gold is the ultimate sophisticated fall look. 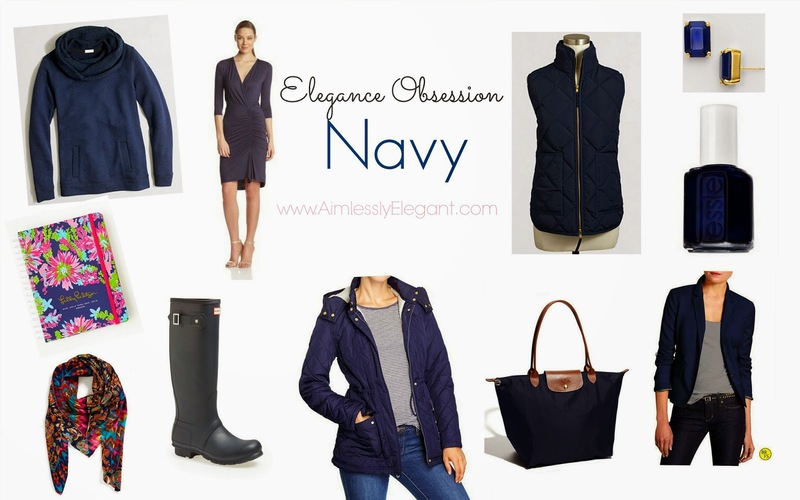 I recently picked up a navy puffer vest with gold hardware from TJMaxx, and I am just itching to wear it! Sounds like a great find, can't wait to see it! Yesterday I managed to pair navy, burgundy, and black and I loved it! I don't think I would have ever put all of those colors together before! I was going through my closet yesterday and notice a lot of navy. I guess I'm crushing on it, too. I need to pick up that essie polish! Get that polish, I'm loving my navy nails!